In our industry, conversations about combating feelings of isolation are not uncommon. While I’m certain there are people who experience and are more prone to feelings of isolation, I’ve never really felt isolated in my work or business so it’s hard for me to relate. I’d wonder, don’t they have friends? Family? Other interests? Don’t they do anything else, go anywhere? I’m sure they do… I know they do! What I suspect is really going on in a lot of these cases isn’t so much isolation, but that they have structured their businesses and are working with clients in ways that lead to burnout, overwhelm, and turn the work into a grind. This is when people feel the need to escape. Hence, the feelings of isolation. So, I thought I would share with you what my typical work day looks like. Maybe it will help you rethink how you view your relationship with clients and give you some ideas on how you might restructure things in your own administrative support business so that it can become or remain a joy rather than a daily drudge. Monday: Closed/Admin Day. This is the day I reserve each week to take care of administration and bookkeeping in my own business, work on my own business projects, perhaps attend or review online classes… those kind of things. Tuesday: Closed/Meeting Day. This is the day I use each week for weekly client meetings (although, my clients have been with me so long at this point, we only meet on the phone about once a month. I always recommend you meet with new retainer clients once a week for at least the first three months of your ongoing relationship. It really helps nurture and cement the relationship and get to know each other. At the three-month point, you can evaluate together how often to continue meeting on the phone each month). As you can see, I effectively have a three-day work week, four if you want to count the Tuesday meeting days. That doesn’t mean I might not work here and there on any of the other days (and only by my choice), but this is the formal infrastructure and systemization I have put in place in my business to help it flow smoothly. A system is really a routine. And systematic routines are what allow you to provide consistency and reliability to clients, which not only improves your quality and service, but also, ironically, gives you greater freedom and flexibility. Establishing a standard by setting a regular routine for meeting clients on the phone one day of the week (same day/time each week per client) is what saved my sanity and ultimately my business and the level and quality of work I provide to clients. It is perhaps the single-most important policy that I instituted in my practice that is responsible for allowing me to triple or quadruple my productivity. I wake up according to my internal alarm clock, which most of the time is around 5ish or 6ish in the morning but sometimes can vary between 6 to 9 a.m. depending on my sleep cycle or how late I went to bed. Make breakfast, drink my first bottle of water for the day and dink around on the computer doing my first sweep of emails. Anything I can respond to quickly, I do. I open that day’s folder in Outlook and begin working on client work. I like to get the quick and easy stuff out of the way first because it pares down the to-do list for that day and stops those little things from niggling at the back of my mind when I’m trying to work on the bigger stuff. It’s important to mention here that all communication with clients is by email. This is a requirement for working together in my business. I do not take phone calls from them or anything else. For me, email is the very best tool for managing the workload. It provides a “paper” trail and documentation and with my folder system, I can easily prioritize and move things around as necessary. So, whatever they need taken care of, the request gets sent to me by email. Period. At some point in the morning, generally before 11am, I go on my daily hike/run. I like to get this in first thing in the morning because I come back really energized and invigorated, it beats the heat in the summertime, and I can save my shower for afterward. I tend to work on bigger work and projects that require more time and concentration in the afternoons. Officially, I have a policy of checking emails 3 times a day (morning, afternoon and evening). Unofficially, depending on how busy I am with work, I do monitor emails. Any client emails that come in throughout the day are put into the next work day’s folder (I have a folder for each working day of my week). This is another key policy I instituted in my business years ago. I do not do any on-demand or same-day work for clients. They are informed of my work policies and procedures when we consult and begin working together so they are fully informed of how things work ahead of time. I don’t take on any work or roles that require me to check-in on any kind of daily basis with them (like managing their calendar or emails, for example). And I only provide business-related support, not personal support (i.e., “No, I’m not going to shop for your wife’s gift or schedule your hair-cut. You can get a concierge service for that.”) This is another way I save myself from getting bogged down in work I have no interest in doing and that I’m not in business to do because I’m not an assistant, I’m an Administrative Consultant. Anything that needs to be done immediately, they need to do themselves. It’s really as simple as that. Because they aren’t hiring an assistant and I don’t let them think of me like that. If that’s what they need, then they need to hire an employee. This is one of the great keys to my success and how I’m able to live a very flexible, freedom-filled life where I still love my work and clients after 15 years of doing this. Throughout the day, whenever I need a little mental break and want to interact with others, or if I have thoughts or ideas I want to share that occur to me, I’ll pop into our Facebook group or post on my blog or check out forums I belong to. For me, these have always been great ways to reach out when you need a little company. I think interaction and participation is key, though. You can lurk, but you just aren’t going to get any real feeling of connection unless you actually talk to people by posting your thoughts and comments, contributing ideas or asking questions. A lot of times people will wonder how I have time to post on these forums and I have to chuckle because they don’t know what I know. First, it only takes a few seconds to post your thoughts. I’m not spending hours and hours in these places (like I’m sure many folks are doing). And second, and perhaps more importantly, I don’t operate my business or work with clients anywhere close to how they are doing it. They’re trying to be assistants instead of strategic administrative support partners. They have turned their business into a job and that’s not how I do it. Which is why I do have a bit more time to blog or check in with people on Facebook here and there: I’m not working as a slave or indentured servant to clients. I’m an expert they partner with for administrative support, not a personal assistant. I run my business on my own terms and that’s to their benefit. My official work day ends at 5 pm. But you know what? Yeah, I sometimes do work in the evenings. Every once in a great while, it’s because I need to. Other times, it’s just because I’m on a roll or otherwise having fun and enjoying my work and don’t want to stop. That’s okay, people!!! You just want it to be on your terms, your choice, and NOT because you have set poor policies and standards and are working with clients in ways that are forcing you to work long into the evening and ignore your family, friends and other life needs. That’s a sure-fire way to kill your business. Another thing I should mention is that I get out when I need to. I listen to my body, my heart, my spirit, and if they tell me I need a change of pace that day, then that’s what I do. Sometimes that means taking the laptop somewhere I love, settling into a comfy booth and ordering something yummy and healthy to eat while I get work done. Sometimes it means not working during the day, but saving what can be done for the evening. Sometimes it means not working at all (as long as there are no pressing, important needs or commitments). Which brings me to another key to my success that I touched on earlier. I don’t do any same day work requests. When a new request comes in, it automatically goes into the next day’s work folder. I never get overwhelmed because I’m only handling the current day’s folder of requests. Everything else is put out of my mind because it’s already handled by being put in the next day’s folder. In my practice, I use what I call a 3/7 guideline. That means, only work that can be done within a 3-business/work day window from the time of request is work I will handle for clients. If they need it sooner, they need to do it themselves. That’s the 3-day part of my work management system. And let me tell you, people, you NEED to give yourself space like this around the work. You folks who are scrambling to get things done the minute they come in are putting out TERRIBLE work product a lot of times because you’re too rushed, too stressed and making mistakes, and you’re creating expectations in clients that set you up for failure. I guarantee you! The “7” part of my 3/7 system is where the client and I touch base on larger, key or ongoing projects during our weekly meeting (i.e., every 7 days). For some things, this is also managed through our online collaborative office suite where they can log in and see for themselves where things are at on those larger/key/ongoing projects. Another little tool I use to manage expectations and keep our relationship resentment-free is the feature in Outlook that allows me to schedule when my reply email is sent to the client. For example, there are occasions when I will attend to client work on a day when I don’t normally/officially work or if I’m ahead of things, I will start work on the next day’s workload. But that doesn’t mean I want the client thinking, “Oh, she’s working on that day now” or that I’m now doing same-day work requests. Maybe it’s because I’m getting older, but I have absolutely no patience for having to constantly remind clients of my standards or policies or protocols. It doesn’t matter how many times you tell them how something works, as soon as you make an exception, they start thinking that’s the rule. Even the most ideal clients do this (there is no such thing as the perfect client because we are all flawed human beings). But it still drives me insane because I like grown-ups to be grown-ups and not little children constantly trying to test or needing to be corrected. So rather than try to change them (which doesn’t work), I just don’t ever email them back the same day. I schedule my reply email to be sent the next business/work day. So, I’m getting it done and out of the way and they’re getting the confirmation email that something has been handled or completed, but they never get the impression that I’m working on weekends or evenings or doing same-day requests. From their perspective, everything is flowing normally and consistently just as my workload policies and schedules have been presented to them. 25 Comments Posted in Administrative Consultants, Administrative PARTNERING, Best Biz Practices, Best Communication Policies, Business Management, Clients, Consulting with Clients, Policies & Procedures, Productivity, Professional Self Esteem, Setting Proper Expectations and Understandings, Time Management, Working with Clients, You Are NOT an Assistant. Bookmark the permalink. Great tips Danielle! So appreciate you sharing your experiences with us. Thanks, Danielle. I’ve always wondered what your typical day looks like. I also think it’s important to get that daily exercise in – it definitely keeps me energized, focused, and ready to tackle the next task. 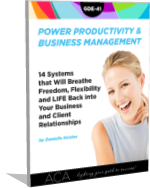 Your tips on using Outlook to manage client communications are just great, Danielle. Outlook has so many good features that we can use to manage our business. To structure your day/week etc is also really wise for a self-employed person. It’s the difference between working FOR someone, versus working FOR YOURSELF. No one is around dictating how we spend our time. We have to have the self-discipline to make a structure. I’m impressed. Thanks for sharing this! You are so welcome, Stephanie. Thank YOU for commenting and adding to the conversation! So true, Shannon! Nothing like the fresh air! I need my endorphin fix every day and actually feel depressed when I miss it. Glad it’s helpful, Judy! Thank you so much for being part of the community here. Always love hearing from you, especially since you are doing such an impressive job of your business. Fantastic work! It’s amazing to see that post after post, you evoke a topic that is dear or challenging to me, which includes time management questions. I’m definitely bookmarking this page, it’ll be of tremendous help when I get started with my VA Business. Thank you so much for sharing your experience! There’s definitely invaluable information in each of your posts. Great information, Danielle. I am re-vamping my business and schedule to be more productive and have time for other things. Looking at how you schedule your week was helpful. Thanks so much for sharing Danielle! I love your tips here. I am trying to get more into the Administrative Consultant mind set and out of the “assistant” mode. A lot of what I do now is same day tasks, like calendar and email management. Can you provide a list of some of the tasks you handle for your clients? I am just curious to see what other types of things I could be doing/offering that will help me change my business for the better! Thanks!!! I can tell you have a wealth of experience and thoroughly enjoy you sharing what has made you successful. Great tips as always. I’m definitely a fan! By the way, you’ll find more on this topic in the Time Management category of my blog. BTW, I know you use outlook, but I stopped using it a while back becuase for some reason, it caused my system to seriously slow. (even though I really loved Outlook!) I now use GMAIL and it has many widgets and add ons like Boomerang..a widget that allows you to schedule when an email is sent, and “boomerang” it so the message comes back to you in a few days or a week to remind you if you haven’t received a reply or for whatever reason. Great tool! So just an FYI for your readers who don’t use Outlook. Interesting that you have took the time to go through what your week looks like and believe after becoming 40++ a 3/7 work week is ideal. Not trying to be nosy or prying but equally while we all aspire to be consultants in our own fortes/niches, could you share ranges of incomes and expenses so that this becomes relative. The idea here is to place this thread in context. Thankfully we have someone who is doing it and not necessarily selling unrealistic visions of what might be. We all have an idea of what we want, or would like to command but just need a further push as to what is possible. Granted I understand they are other factors involved, drive, passion, ability, niche, demand, etc – share with us your real experiences. Thanks for the link to the Time Management category. The Flexibility for Flexibility Sake has parts of it that almost describe me and my current scenario perfectly. Yikes! I know I’ve got to start saying “no” to this client, and I totally admit I created the monster and let him think of me as an employee from day one…all for sake of a nice monthly retainer which really profits me nothing now. Thank you Danielle! Establishing policies is something I read before in your posts (I read EVERY ONE OF THEM!) and which inspired me to do. Unfortunately, as I didn’t do that at the early stages of my business, it’s getting hard with one of my clients… but I definitely agree with you that it’s much more easy to establish policies, communicate them loud and clear to our clients and follow them no matter what. Thank you! Stephanie T., you asked a great question and I have a post coming up that will help you with your thinking when it comes to services. Stay tuned! Spoiled clients are the hardest ones to wean off of policies and procedures that weren’t sustainable for you in the first place. I mean, we should spoil our clients with love and great care, quality and service, but not spoil them with ways of working together that aren’t good for you (and which ultimately isn’t good for them). If your business can’t flourish and grow and keep YOU mentallly and financially healthy, that is certainly not good for the client because you will eventually be overwhelmed, become unhappy and burnout. One other tip… and this is really fear-based thinking holding you hostage and it’s not something I encourage, but it’s still a reality for a lot of people and I’m nothing if not practical… If you feel you aren’t in a position to let an unideal client go because you need the money, what you can do is bring new clients onto your roster under your new standards and protocols. Once you are in a better position, you can then be more confident in telling the unideal client (basically), “This is how my practice runs now. You are welcome to stay as long as you are amendable to these changes. Otherwise, there’s not going to be a fit any longer and I wish you well.” And then let them be on their merry way so that you can get rid of the dead weight, the negative mental energy and FLOURISH forward happily! Danielle, thank you so much for posting! This is a tremendous help to me as I move forward in starting my own VA business. I appreciate how you emphasize the difference between administrative support and an administrative consultant — I found myself confusing the two very often for too long. I also think part of the problem was the fear that I wouldn’t find enough project work to sustain the business and would have to resort back to administrative support. Thank you so much for sharing! I think you may still misunderstand. Administrative support IS what an Administrative Consultant does. Most people in our industry do have a much harder time making a living when they are trying to do it with project work. Thanks so much for the scheduling tip in Outlook – I started using it this week. The only thing I have noticed though is that when I go to my sent items it shows the message as being sent when I hit send even though it wasn’t scheduled to send until the next day and I know it didn’t send until that next day because I saw it sitting there in my outbox. Have you noticed this? What day/time are the recipients seeing? I am going to Options–>Delay Delivery. Is that how you do it? Thanks! Yes, if you’re using newer Outlook, that’s where it would be. I still use 2003 Outlook on my desktop and haven’t ever had that issue. But in looking at Outlook 2010 on my laptop, I see there is a box to save a copy. If that is checked by default, try unchecking it and see if that helps. There should really only be a sent message once it is actually sent and it would appear with that date/time at the recipient’s end as well. I really enjoyed this post. I think your tips about moving requests to the next day folder in Outlook, as well as the 3/7 rule are great! Thank you! Thank you for posting about your typical day Danielle. I think I’m going to analyze my time and put mine out there in a blog too. Mine is a little different since I have my almost 4 year old home with me. I like what you wrote about listening to your mind/body ect. I think I don’t do that enough and end up working too many hours or trying to push through and work when I really should be resting. Do you have any distractions at home? (Pets, family, lawn mowers etc) I’d love to see a post about how you are able to drown out any distractions. I’ve had a few people asking me that question lately and I’d love to see how others deal with it. Do you work while listening to music etc. I wish I did have some great tips for ya, Dani. I have no kids at home anymore and at this stage in my life and business, I honestly don’t have tons of distractions other than the occasional one here or there that everyone has, but that’s easily remedied. I’ve worked hard to get both my physical and procedural business environment EXACTLY how I like things and how they are most condusive to my productivity. I give all the props in the world to those still raising little ones AND trying to start/grow/run a business. I can’t even imagine how difficult that is (well, I CAN imagine, lol)! I know one of the reasons a lot of people do start their businesses is so they can be home more with the kids. At the same time, though, it’s really difficult to get anything done if you are constantly interrupted and your concentration is broken. So if it were me, I think I would still be having the kids go to daycare and playgroups and making the most of my time when they were in school, sending them to grandma’s, having dad spend his quality time with them, um, out of the house… you know, just basically getting rid of them any time I could, lol lol lol. I’m totally kidding, but I think you know what I mean, lol. It’s just super important to have those undisturbed hours so you can focus and get things done. And, of course, getting help in whatever way you can. Solopreneur does not mean doing everything yourself. Partner with your own Administrative Consultant. Maybe you have family members or friends who can be helpful in the office. My daughter helps me out here and there. I have a few professionals I call on for certain things (e.g., programmer). I’ve also established relationships with a few college kids who do project work for me on occasion. I also love the idea of teaching our kids about business and independence and self-reliance. There were a few years that my daughter worked with me quite extensively. I absolutely loved it and would have loved to have her in the business full time, but, sad to say, office work is just not her thang so she’s moved on to other pastures. So put those little hands and minds to work if you can find things for them to do in the business. I think seeing mom doing something important for herself and out of love for her family, and teaching them about business and entrepreneurialism, is such a wonderful thing to share with our kids.